The ephrin-ligand (ephrin) ephrin-receptor (Eph) cell adhesion system is one of the most intensively studied intercellular signaling systems. The identification of the molecular processes underlying ephrin-mediated signaling led to prominent and widely accepted models of axon guidance and neuronal map formation. Ephs are members of the tyrosine kinase receptor family, which become activated upon ligand binding and heterotetramer formation. The intrinsic tyrosine kinase activity of Ephs contributes to this by auto- and transphosphorylation of Ephs, which provides binding sites for the 60 kDa nonreceptor tyrosine kinase (Src) homology domain-2 (SH2) containing scaffold or adaptor proteins (forward signaling). In addition, the formation of the Eph-ephrin heterotetramers repositions ephrin transmembrane and cytoplasmic domains, converting them into a signaling configuration. This is followed by phosphorylation of the ephrin cytoplasmic tail on tyrosine residues initiating reverse signaling through, among others, regulation of G-proteins. The complexity of ephrin-associated signaling might actually be interpreted as a spatial and temporal signaling event network, where ephrinA-dependent processes represent repulsive cues that lead to growth cone collapse and neurite retraction and ephrinB-related processes represent rather attractive cues, which promote arborization at the axon termination zone. However, it is important to note that ephrin signaling may exert divergent effects on axon geometry in different brain regions (for enhanced reading see refs. 12,13 and Chapter 10). Studies on the formation of the retino-topic representation map within the superior colliculus (SC) provided valuable insights into the spatial aspects of ephrin-associated signaling, which represents a cellular mechanism underlying the establishment of the spatially highly ordered retinal projection system. It was shown that axon arborization of retinal ganglion cells (RGCs) within the SC occurs along two sets of orthogonally oriented axes: (1) the nasal-temporal retinal axis corresponds to the anterior-posterior SC axis, and (2) the dorsal-ventral retinal axis corresponds to the lateral-medial SC axis. EphrinA receptor (EphA) and ephrinA ligand expression increases and decreases, respectively, along the nasaltemporal retinal axis, while ephrinA ligand and EphA expression increases and decreases, respectively, along the anterior-posterior SC axis. EphrinB receptor (EphB) and ephrinB ligand expression increases and decreases, respectively, along the dorsal-ventral retinal axis while ephrinB ligand and EphB expression increases and decreases, respectively, along the lateral-medial SC axis. These orthogonally oriented counter gradients precisely determine spatial positions within the SC, where retinal axon arborization is required, i.e., they define the retino-topic representation of retinal afferents within the SC14. The temporal aspect of ephrin-mediated signaling involves protein tyrosine phosphatase (PTP)B1 activation15. By tyrosine dephosphorylation, PTPB1 allows for a switch from an initially Src-kinase-related signaling, which elicits axon repulsive mechanisms by modulating the activity of Rho GTPases (see below), to a PSD-95/discs large/zonula occludens (PDZ) domain-mediated signaling16, which implies a means for the recruitment of synaptic proteins to newly formed synapses (see below, 4.1). This also makes clear that the degree of ephrin-ligand tyrosine phosphorylation, which changes along the respective Eph expression gradients, determines the relative contribution of Src- and PDZ-related signaling events to processes involved in axon geometry and synapse formation. The small GTPases RhoA, Rac and cell division cycle 42 (cdc42) are among the effector molecules of ephrin-associated signaling with respect to cytoskeletal dynamics (Figure 21.2A). RhoA and Rac/cdc42 signaling is inversely arranged. RhoA activation, which is negatively controlled by protein kinase A (PKA) phosphorylation, and concomitant Rac inactivation appears to mediate axon repulsion. Figure 21.2. 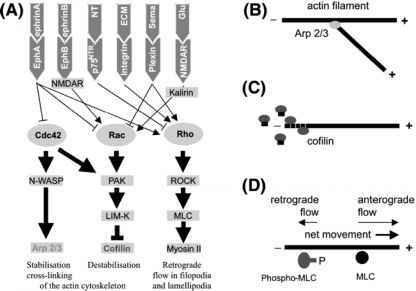 Compendium of the Roles of RhoA, Rac, and cdc42 Signaling in Actin Cytoskeleton Dynamics. (A) Inverse relationship between activation of RhoA and Rac/cdc42 pathways. Physiological cues, signaling network, and effectors are illustrated. Activation of RhoA leads to growth cone retraction through MLC phosphorylation (see Figure 21.1C). Activation of Rac/cdc42 promotes the formation of branched actin filaments and, if dominating over ROCK-dependent mechanisms, leads to growth cone forward movement and exploration of the extracellular milieu. Please note that EphA-dependent downstream signaling to Rho and Rac/cdc42 engages the GDP-GTP exchange factor ephexin as an intermediate step (not shown). (B,C) Effector molecules regulating actin dynamics within the growth cone. (B) Arp 2/3 nucleates de novo actin polymerization from existing actin filaments by binding actin. This contributes to the formation of branched actin filament networks and outgrowth of protrusions. (C) Cofilin is an actin depolymerization factor that destabilizes actin filaments. By inhibition of cofilin through Rac/cdc42, PAK, and LIM domain-containing kinase (LIM-K) the outgrowth of protrusions is favored. (D) As shown in Figure 21.1C and discussed in the text, the phosphorylation status of MLC relative to dephosphorylated MLC decides about the net direction of growth cone movements. Plus (+) and minus (-) ends of actin filaments are indicated. NT: neurotrophin, Sema: semaphorins, Glu: glutamate, N-Wasp: neuronal related to Wiskott-Aldrich syndrome protein, ECM: extracellular matrix, ROCK: Rho-associated coiled-coil containing kinase, LIM-K: LIM domain containing kinase. The mechanism by which RhoA activation prevents axon outgrowth involves a ROCK-mediated phosphorylation and inhibition of the myosin phosphatase that leads to increased myosin II activity through phospho-MLC 17. In fact, it is believed that enhancing myosin II activity increases the speed of retrograde actin flow in filopodia and lamellipodia, a process that results in a net retrograde movement and retraction (Figures 21.1C, 21.2D). The phosphorylation status of MLC relative to dephosphorylated MLC, thus, decides about the net direction of growth cone movements. ROCK activation indeed must play a crucial role in regulating cytoskeletal dynamics since its experimental activation per se appears to be sufficient for preventing axon outgrowth18 and for eliciting dendritic19 or axonal20 retraction. Rac/cdc42 and RhoA have opposite effects on growth cone dynamics, and further downstream Rac/cdc42 engage signaling pathways, which involve, among others, the p21-activated kinase (PAK) and a neuronal protein related to the Wiskott-Aldrich syndrome protein (N-WASP), respectively (Figure 21.2A). N-WASP is relieved from autoinhibition by cdc42 or by phosphatidylinositol bisphosphate (PIP2) binding (see below, protein kinase C [PKC] signaling) and triggers de novo actin polymerization through Arp 2/3 activation (see Chapter 17). In addition, actin depolymerization is inhibited by decreasing cofilin activity as a consequence of LIM-K-mediated serine phosphorylation, which is under control of PAK activity21. Phosphorylation of cofilin causes it to dissociate from actin, which stabilizes the (-) ends of filamentous actin. However, actin release from phosphorylated cofilin increases its availability for assembly with the (+) ends of filamentous actin. These functionally antagonistic effects of cofilin phosphory-lation with respect to actin filament dynamics may, however, be reconciled when considering that the temporal aspects of cofilin phosphorylation by LIM-K outline a dual mode of LIM-K function, where initial cofilin phosphorylation is followed by cofilin dephosphorylation presumably via the protein phosphatases (PP)1 and PP2A21. The focal adhesion kinase (FAK) was reported to control RhoA activation. FAK positively regulates the activity Rho GTPases by accelerating the GDP-GTP exchange rate through activation in consequence of tyrosine phosphorylation of the GDP-GTP exchange factor p190RhoGEF22 and inhibition of the GTPase-activating protein p190RhoGAP, the latter mechanism including Src-kinase activation as intermediate step20. Upon integrin-mediated cell adhesion, FAK autophosphorylation and consecutive phosphorylation of additional tyrosine residues by Src kinase orchestrate the communication of the adhesive signal further downstream to the interior of the cell. Considering the effect that FAK activation exerts on RhoA activity one could expect that FAK is a negative regulator of axon arborization. Indeed, FAK inactivation was found to promote the arborization of axons and, as a consequence of their disability to retract due to reduced turnover of focal adhesion contacts, to increase the total length of axonal arbors23. Thus, FAK shifts the set point of the equilibrium between axon growth cone forward movement and retraction by selectively engaging intracellular signaling events responsible for axonal growth cone collapse and retraction. The list of protein kinases that regulate axon elongation and arborization is ever growing. As mentioned above, PKA exerts a modulatory effect on neuron shape. In fact, the involvement of PKA in cytoskeletal dynamics is obvious because PKA activation was shown to phosphorylate and consequently inhibit RhoA activity, which implies a stimulatory effect on neurite outgrowth and arborization. PKA is activated in a cyclic adenosine monophosphate (cAMP) dependent way, and cAMP was recently shown to have a stimulatory effect on the mitogen-activated protein kinase (MAPK) pathway. MAPK activation occurs in response to growth factor binding to, and activation of, tyrosine kinase receptors (e.g., tropomyosin-related kinase [Trk]A) and Ras GTPase, which are well known to regulate neuronal differentiation and survival24,25. Activated MAPK phosphorylates MLC and affects growth cone actin dynamics through the formerly discussed myosin II-dependent mechanism. However, MAPK activation also promotes phosphorylation of MAPs through phosphorylation-dependent activation of glycogen synthase kinase 3P (GSK3P), which results in enhanced neurite arborization26. Inhibition of GSK3P activity by phosphatidylinositol-3-kinase (PI3K) activation results in enhanced binding of MAPs to microtubules and micro-tubule stabilization, which favors elongation. Neurite arborization and elongation, thus, also depends on the appropriate balance between unstable and stable microtubules, regulated through GSK3P and PI3K, respectively9. A multitude of other signals, including activation of protein kinase C (PKC) upon fibroblast growth factor-2 (FGF-2) binding to its tyrosine kinase receptor (FGFR), converge into the Ras signaling cascade and culminate in the activation of the MAPK pathway. A growing number of studies identified PKC as a target of various signaling components known to be involved in regulating cytoskeletal dynamics. Among these components are neurotrophins, such as brain-derived neurotrophic factor (BDNF), integrins, arachidonic acid, and intracellular Ca2+. PKC is activated in a phospholipase C (PLC)-dependent way. Metabotropic, G-protein coupled neurotransmitter receptor activation leads to PLC activation, which processes PIP2 to generate two second messengers, IP3 and diacylglycerol (DAG). DAG in conjunction with IP3-mediated raise in intracellular Ca2+ activates conventional, Ca2+ sensitive PKC isoforms27. Indeed, many studies identified PKC as a positive regulator of neurite arborization and growth. As mentioned above, MAPs, such as MAP2 (preferentially in dendrites) and tau (preferentially in axons), are abundant substrates for serine/threonine kinases. Thus, the list of kinases affecting the phosphorylation status of MAPs includes GSK3P, PKA, PKC, the microtubule affinity regulating kinase (MARK), cyclin-dependent kinase 5 (cdk5), and Ca2+/calmodulin-dependent protein kinases (CaMK). The degree of neurite branching is correlated with the phosphorylation status of MAP2 and tau. Tau hyperphosphorylation, however, has been associated with severe brain disorders, such as Alzheimer's disease. On the other hand, tau hypo-phosphorylation as a consequence of kinase inhibition, e.g., PKA, PKC, or CaMK, is associated with inhibition of axon branching8 and might consequently provoke deficits in brain development and function. Again, the relative phosphorylation status of the target proteins, which results from a complex pattern of distinct kinase activities, plays a crucial role in regulating cytoskeletal dynamics6.